Transform your regular bowl of oatmeal topped with fresh fruit into a drinkable breakfast. Strawberries, oats, bananas, chia seeds, and coconut milk come together in a hearty and filling smoothie that will keep you full until lunch. It is packed with fiber, nutrients, and whole glass-worth of flavor! Add more coconut milk for a thinner consistency. As with all smoothies, this is a very versatile recipe. Swap out the chia seeds for flax seeds or hemp seeds. Use almond milk or water instead of coconut milk. Toss in some raw almonds or egg white powder for added protein. Per Serving: 611 calories; 36g fat; 71.2g carbohydrates; 10g protein; 0mg cholesterol; 31mg sodium. I really enjoyed the oats in this smoothie, I am a big smoothie fan and had never thought about putting oats in my smoothie until I saw this recipe. 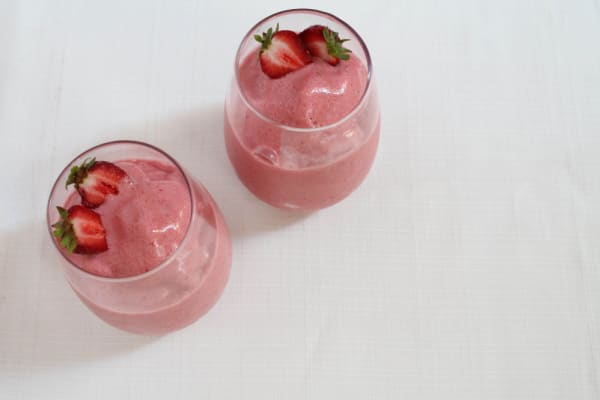 Bananas and Strawberry always create an amazing blend. I used coconut water as I don't digest coconut milk very well. I have been using rolled oats in my blueberry-kale smoothie for years now to very good effect, so I loved the idea of this. It's pretty straightforward, flavor-wise, but otherwise not quite adventurous enough for me. Might add a pinch of ground Thai chile and some yogurt for my future remix of this idea. Maybe even replace the banana with avocado.